Evercool introduces the MUF-12, a new 120mm USB desk fan with a magnet base. The fan has EL bearing and spins between 1200-1700RPM, with a noise level of 24.2-31.7dBA. The fan can be rotated 360-degrees, and the package includes an USB power cable as well as an AC adapter so users can select the power supply on demand. The most essential in hot sultry weather! Must buy for the summer leading edge of trends. For the computer case cooling, the case is no longer staged like an oven in the hot summer. Align your CPU to give it a big cool breeze and make your laptop is no more overheating. MUF-12—a lightweight, simple stylish shape mini-pedestal fan with a white, delicate and compact appearance. Powerful magnets design base provides a secure attachment. Easily adsorb on any magnetic metal surface, save the placement space. Firmly adsorb on the metal containers, PC case, office partition and desktop, etc. 360 ° rotation fan can be adjusted airflow direction. It improves the traditional fan which only available one-way airflow supply problem. Low noise high cooling performance device provides 2 strength of airflow. MUF-12 functions with simple power switch design. Users only have to connect the computer's USB port, and then press the fan side of the switch. Package attached the USB power cable and AC adapter; users can select the power supply on demand. 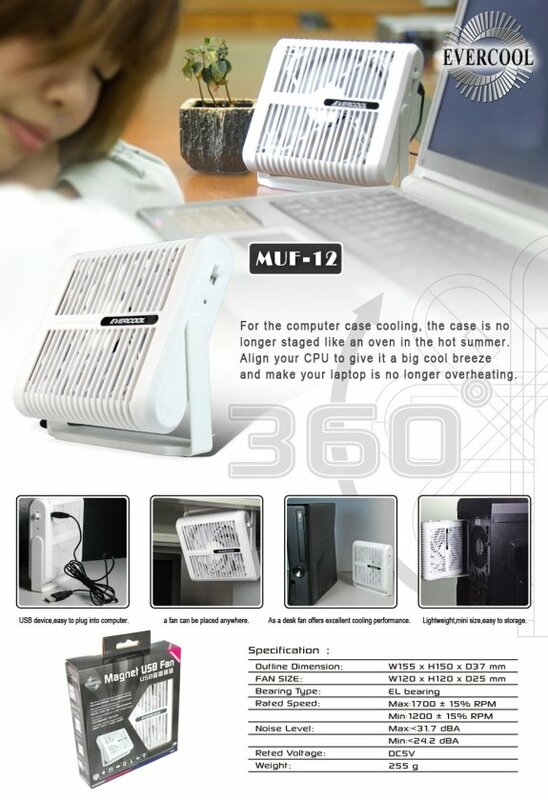 - A 12 cm multi-functional superior airflow efficiency fan that provides high-airflow-performance.